Nadav Nirenberg: West Coast tour with Zongo Junction. Tacos. West Coast tour with Zongo Junction. Tacos. 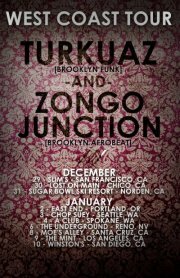 After the current Streetlight tour I'll be heading back to California with BK friends Zongo Junction for a couple of weeks. I'll be subbing for my good friend Kevin Moehringer while he heads to Australia with the Easy Star All-Stars. Zongo is a 10-piece original afrobeat group...can't wait! It's a co-headlining tour with fellow Brooklyn-ites Turkuaz (11-piece party funk), so you know it's gonna be a hang. Hope to see some familiar faces! 1/8 - Santa Cruz, CA (Moe's Alley) Missing this gig! 1/10 - San Diego, CA (Winston's) Missing this gig! Luckily this tour coincides perfectly with a Streetlight recording date in LA, so it looks like I'll be in Cali for about 25 of the next 29 days. Taco time. Other people's Mashups of my tunes!